addicts to smoking, price divided by two. And of course the famous Bohemian cristal. Good choose well, many object being a little (lot) too kitschy for my liking. Observe the museum of horrors! 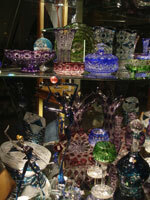 2 Swarovski boutiques in downtown Prague for you ladies and gentlemen to offer. Add to bookmark this page Czech-Republic " Souvenir from Prague " - Firefox do "Ctrl D"